Ok, now that we understand the meaning of marketing, let’s delve into its world. 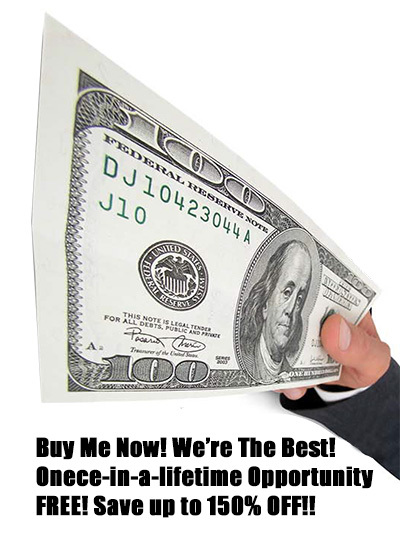 The one truth about marketing is this: it costs to advertise and it pays to publicize. As a marketing pundit, I know that the more you know about the differences between advertising and public relations, the better you will be able to communicate your message to the audiences you wish to reach, and the more effective you will be in branding and positioning your business, product, or service within your sector. Most business owners understand that in order to get more business, you must market your business. So again, what is marketing? Simply put, marketing is everything that you do to get the word out about your business, product or service. That includes both advertising and public relations – the two most commonly used but very different marketing tools. Ok, let’s look at the two. What are they… and what are their main differences? Advertising is one of the most frequently used marketing tools for businesses that want to communicate a message to their target audiences. Public relations is a program composed of messages designed to increase public awareness, and/or create a positive image or interest. The role of public relations is to pique the interest of your targeted market, but not necessarily to persuade them to “Act Immediately” or to “Buy Something”… as with advertising. In order for a public relations program to work, your message must be of interest not only to the public but also to the media. The objective is to develop a message that the media will deem of great interest to their audiences. Therefore, the key to effective PR messaging is newsworthiness – which could be beneficial or not – since you do not have control of the editorial slant or spin. With Advertising: You, the company pay for your ad space. You know exactly where, when, and how that ad will be published. 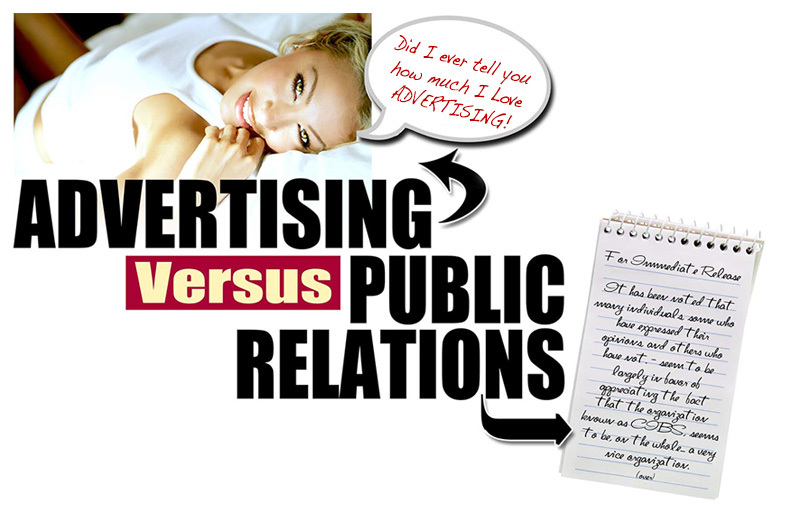 With Public Relations: Your goal is to attain free publicity for your company from news conferences to press releases. Your goal is to attain free space. You have no control over when it will appear, or how it will be utilized. With Advertising: Since you’re paying for the space, you have TOTAL CREATIVE CONTROL over what goes into that ad, i.e. what it says… what it shows… what it promises… what it subliminally implies… etc. With Public Relations: You have NO CONTROL over how the media might present your information (if they even decide to use your information at all). They’re not obligated to cover your event or to publish your press releases just because you’ve provided information to them. With Advertising: Since you pay and own the media space, you can run your ads anytime, anyplace, over and over for as long as you wish – or for as long as your budget allows. Plus, an ad generally has a longer shelf life than a press release. With Public Relations: Generally, you submit a press release about a new product or event once. The PR exposure you receive is only circulated once. An editor will not publish your same press release three or four times in their publication. With Advertising: Both “Consumers” and the “Business Community” know that when they are viewing an advertisement, they are being informed and perhaps urged to purchase a product or motivated to use your service. With Advertising: You get to utilize your creativity in both imagery and in words. There is no limit nor are there any real boundaries when it comes to creating new advertising campaigns or marketing concepts. Your limit is your imagination. With Public Relations: You have to have a knack for creating a good “spin” for your news and for generating the correct “buzz” through that news. With Advertising: You’re focused on delivering a finely tuned and scripted message to your target audience, and you’re able to advertise accordingly. For example, you wouldn’t advertise a women’s TV network in a male-oriented sports magazine. With Public Relations: You must have an angle in order to hook the editors to get them to use your information… or at least to be included in an article, or to possibly cover your event. With Advertising: You’ve got the power! You make all the decisions! You can say what you want and leave out what you want. That’s control! “Buy this product!” “Act now!” “Call today!” “ Tests conclude we’re better” “Best Value!” – These are all things you can say in an advertisement. You can and want to use the proper buzz words of your industry to influence and to motivate people to buy your product or service. QUESTION? Which should you use? ADVERTISING or PUBLIC RELATIONS? THE ANSWER depends on your objectives! • If your intention is to inform, persuade, or remind your targeted market about your business’s product and/or service, usually with the intention of making a sale or business transaction, then ADVERTISING IS YOUR ANSWER! • If your intention and efforts are to create good will, to keep the company and/or product in front of the public, or to humanize a company so the public relates to its people or reputation rather than viewing the company as a non-personal entity… then PUBLIC RELATIONS IS YOUR ANSWER! IN SPITE OF THEIR DIVERGENCE, never forget (for those who enjoy a perfect world) that ADVERTISING and PUBLIC RELATIONS can and do complement each other if they are both used effectively with supporting messages. What message do you want to convey to them? What do we want your target market to do? Do you want them to feel good about, or to believe something about, or do you want them to buy, purchase, or rent your business’s products or services? What end result do you want to achieve with your campaign? If you can answer these questions with finite responses… then you will know whether to focus on developing an effective advertising plan or campaign… or to utilize PR… or both.